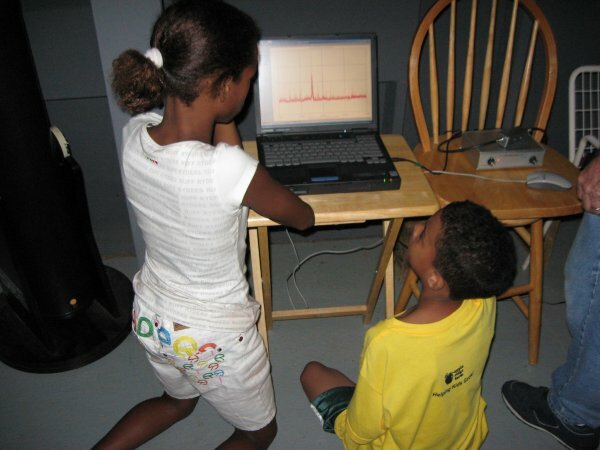 "Solar and Planetary Radio Astronomy for Schools"
The opinions expressed in this newsletter are those of the authors and not necessarily those of Radio JOVE, or NASA. Radio Jove Approaching 10-Years Old! Apple Ridge Farm is located close to Copper Hill, Virginia, 25 miles south of Roanoke, Virginia via U.S. Route 221. The farm "provides outdoor and educational experiences for under-served youth". 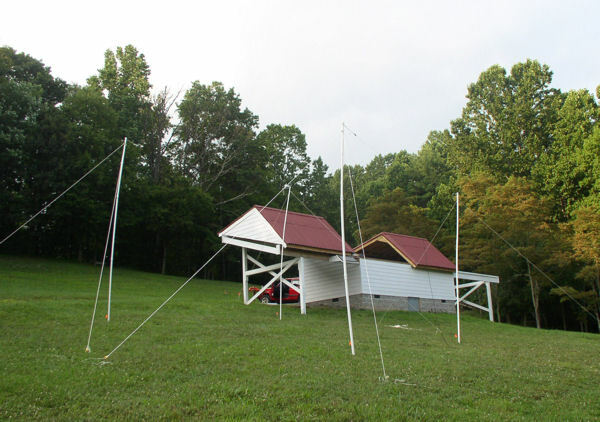 On Saturday evening July 26th GE Observatory volunteers and Roanoke Valley Astronomical Society (RVAS; http://www.rvasclub.org/) members, Paul Caffrey, Roger Pommerenke and myself set up the Radio Jove dual dipole and RJ1 receiver to observe a predicted Io-B radio storm from Jupiter. We had the system set up by seven and were ready to monitor the Io-B event later that evening. In conjunction with the Io-B observing we were expecting a group of youngsters from Carver Elementary's DISCO (Discover, Investigate, Study, Collaborate, Observe) Science Academy of Richmond, Virginia. The group had come to Apple Ridge for several days to study nature and for recreation at the science center on the farm. We had planned to have simultaneous viewings of Jupiter in both the visual and RF portions of the spectrum. However, the cloud cover did not want to clear and we were sure that the optical observing would not be an option. The student group arrived at the observatory at about 9:15 P.M. There was a great deal of interest in the radio telescope and the students asked several questions about it and the Radio Jove program. The sky had been overcast, but, after the students' arrival, holes started opening up in the cloud cover. Shortly afterwards, the sky was mostly clear and the seeing was the best that it had been in weeks. Jupiter was visible and the Great Red Spot was close to the Central Meridian. Other detail was also visible in the cloud belts. The Io-B was predicted to begin at about 9:48 P.M. but we didn’t detect any bursts of activity until 10:40 P.M. The students had to leave at 10:30 P.M. and just missed the first of several RF bursts that occurred during the evening. During the time the students were there, Paul and Roger gave them a tour of the evening sky through the observatory telescopes and just using their eyes. They were able to view Jupiter and several constellations and various objects that were visible during the evening. The evening turned out to be a great success. The group numbered 27 persons and it was a very exciting time for the students. The weather and Jupiter both cooperated to make for excellent viewing through both the optical and radio telescopes. My Grandson Wesley, age 13, was looking forward to going on a great adventure, among the hills of West Virginia, to the sleepy little town of Green Bank. Nestled in a valley and surrounded by mountains on three sides it was the perfect place to go to observe the night skies. The location is free of pollution in both the visible and radio portions of the spectrum which made it the ideal location to build the 100 meter Green Bank Radio Telescope as well as several other smaller radio telescopes. Early in the a.m. of July 3rd we loaded up the Jeep with my eight inch Meade LX90 and other essentials and headed for the Green Bank Star Quest V. We left Lynchburg and arrived at Green Bank around noon time. The weather was mostly clear and warm which made for a pleasant drive. After arriving at the NRAO complex we went to the tour center and registered for the Star Quest event. 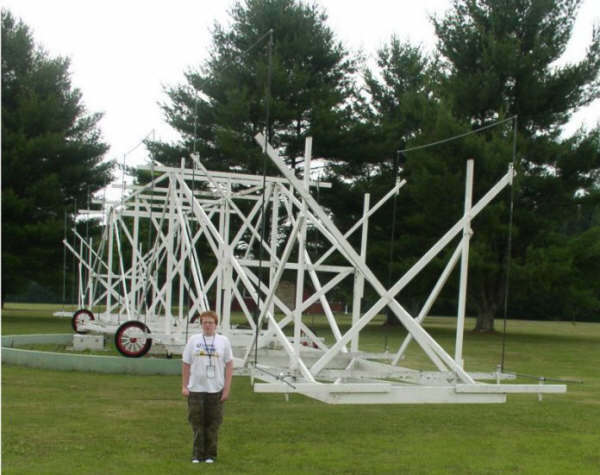 After registration we walked around the grounds in the vicinity of the tour center and viewed the working model of the Jansky, "Merry Go-round", Bruce array antenna, and the original 30-foot radio telescope dish built by amateur radio astronomer, Grote Reber. Later that afternoon, we returned from visiting the campground location and observing site for participants in Star Quest V. We then attended a presentation by Dr. Jim Thieman from the NASA Greenbelt Space Flight Center in Greenbelt, Maryland, on “The Radio Jove Project“. After Dr. Thieman’s presentation my grandson helped set up the Jove RJ1 receiver just outside the NRAO tour center and Dr. Thieman fielded questions about the set up. Later in the evening, after dinner, I debated unloading the LX90 and carrying it to the observing location at the campsites. The sky was increasingly cloudy and was obviously not going to clear so we retired to the Motel until the next morning. Friday morning, after breakfast at the motel, we drove to the NRAO tour center and attended the class "Introduction to Radio Astronomy" by Sue Ann Heatherly from NRAO. The class was held in the "Faraday Computer Lab", which houses several computers used for educational purposes. 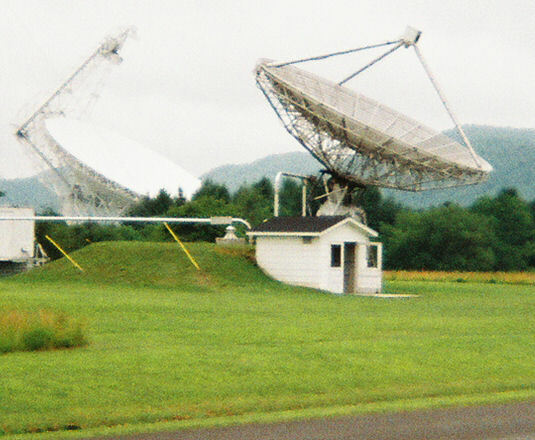 The lab is completely shielded by copper sheets to prevent any interference with the radio telescopes on the site. After the radio astronomy class we went with a group of twenty persons to the 40 foot Radio Dish Orientation presented by SARA, Society of Amateur Radio Astronomers, Tom Crowley. He led the group through the operation of the 40m foot telescope and its uses. My Grandson participated in the operation of the telescope by helping with calculations needed to position the dish and tune the local oscillator for the receiver. Mr. Crowley gave the chart recorder record of the proceedings to him as a souvenir of the occasion. Tom Crowley, President, SARA and Wesley Thomas beside one of the "Blue Taxis"
Later that evening, in a group of six, we were driven back to the 40 foot dish in one of the diesel powered "Blue Taxis" driven by Mr. Crowley. The taxis are used by technicians and scientists at NRAO to travel to the various dish locations. The group set the telescope to observe the elliptical galaxy M87, in Virgo, at the HI, neutral hydrogen, frequency of 1420.41 Mhz. The galaxy transited the meridian at 12:28 LST. The chart showed the rise and decline of the receive signal strength and a brightness of about 200 Jansky. Friday evening was another washout for optical observing. We returned to the motel for Dinner. Later that evening there was a fireworks display just behind the motel that rivaled displays in much bigger towns or cities. It was a nice touch to the days end. Saturday morning we checked out and headed to the NRAO tour center. We took the bus tour of the dish sites including the 100 meter Robert C. Byrd radio telescope, also known as the Green Bank Telescope or GBT. After the tour we said goodbye to Green Bank and the NRAO. My grandson left with a renewed excitement about - and interest in - astronomy. The Combined Science Center http://sciencecenter.no-ip.org/ is a Colorado non-profit organization. Conceived as a way to address the need for practical experience with math and science at high school and junior college level, CSC is a management and control element linking national experts acting as Project Mentors to local teachers acting as Project Managers, leading small Project Teams composed of local students. Essentially, except in scope, this is the formula for most special-subject clubs and class projects. There is, however, a difference from a traditional school club or class project. As the education system is a very tightly controlled environment, opportunities for outside groups to interact with students is typically through clubs or special events. School clubs are sponsored by teachers on a voluntary basis but administered by school administrators. Moreover, students are frequently unable to participate in or attend club functions if they require special transportation. Thus, any process that increases student participation without disturbing the traditional school structure or, better yet, is a part of or is a segment within the school day has great potential. This is where telecommunications, computers, chat software, and technical experience come into play and is the approach CSC takes. Working with prominent national research institutes, local science groups and clubs already involved in science outreach, I developed a plan around ham radios, computers, telecommunications, radio propagation sensors from Stanford Solar Institute, and magnetometer equipment from UCLA. 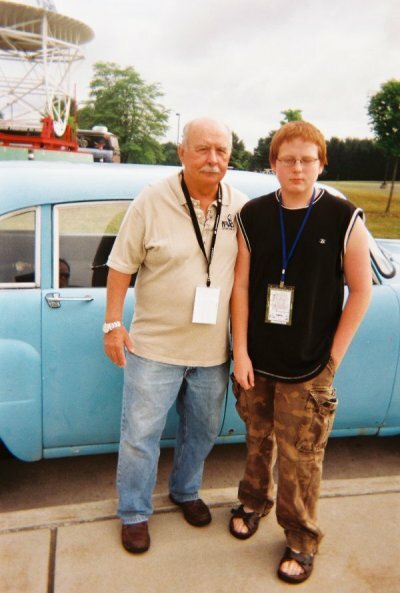 I already had several VLF, UHF, VHF radios and various types of antennas plus older generation computers. With the addition of specialized research equipment from Stanford and UCLA, I expanded the idea to include complementary science projects such as Radio JOVE, weather satellite receivers, slow scan TV (SSTV), and radio beaconing. CSC now includes eleven independent but complementary and mutually supporting science experiments. Radio Jove has special meaning and relevance to us because we are focused on investigating aspects of solar radiation, radio propagation, and magnetic phenomena closely aligned with ongoing space weather studies. Radio Jove is part of the total picture, so a method of integrating study of Jupiter into our scheme is appropriate. Initially located at the Pueblo Nature Center, a large open park with room to install all antennas and sensors, CSC eventually found a location closer to the center of town. As a result, we were able to obtain and partially outfit a construction site trailer that is ideal for our purposes. Open inside but without amenities, having AC and heating and with plenty of power outlets and room for workbenches, labs, computers and radios, the facility is now situated within a fenced and secure area. CSC has working relations with ARRL, Colorado Space Grant Consortium, Delfi-C3, Stanford University, US Air Force Academy, Famatech Software, and is running an APRS Tier II Server. Other groups or agencies such as Oakridge National Laboratories and GENSO (Global Educational Network for Satellite Operations) provide guidance and critical technical assistance or access to science projects or resources. 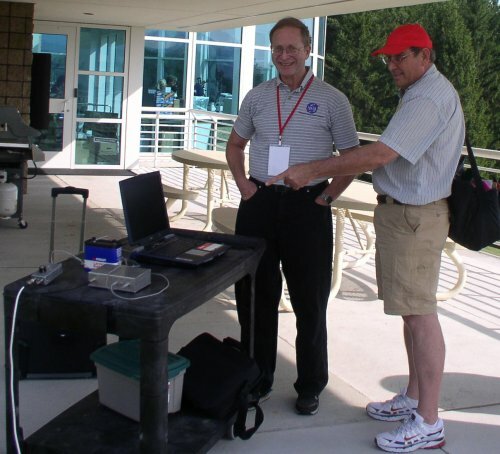 Local ham radio clubs such as the Pueblo Ham Radio Club and the local CSU-Pueblo astronomy club are also assisting or helped us with technical support. After nine years of maturation of Radio-SkyPipe 1, version 2 has been released. Radio-SkyPipe is the data collection program used by most Radio Jove participants. Simply connect the output of your Jove receiver to your computer sound card and with a few button clicks you can be saving charts of your data in no time. In fact, you can share your charts in real time with others over the Internet. If you do not have a Jove receiver yet, you can use the program to monitor the receivers of others Jove participants around the world. Version 2 has several important new features that we will be using to help make our observations more scientifically rigorous. We will discuss these more in a future edition of the Jove Bulletin, but now is the time to begin acquainting yourself with the program. If you already use Radio-SkyPipe 1, you do not have to abandon it. Version 2 can work on the same PC. Please visit http://radiosky.com/skypipeishere.html to get your copy and learn more. S-burst activity is seen between 18 and 26 MHz during an Io-B storm. Each individual S-burst lasts for only a fraction of a second and bursts can occur at rates of dozens of bursts per second. Very short S-bursts appear above 24 MHz while L-bursts are seen at the lower frequencies. Diagonal bands in the L-burst emission regions are modulation lanes. A strong solar burst – seen on both the 1 minute time scale of the top panel and the 10 minute scale of the bottom panel. The burst seen in the center of the top panel appears near the right hand edge of the bottom panel. A calibration sequence is seen on the bottom panel running from 1939 to 1940. Horizontal lines are stations of varying strengths. Numerous stations near 27 MHz are CB transmissions. Solar Burst activity. The lower panel also shows a calibration sequence from 1939 to 1940 UT. The vertical lines are from distant lightning strikes while the horizontal traces at 20 and 21.5 MHz are weak stations. Up until about 2007 UT the spectrum is normal with several stations (horizontal lines) present. 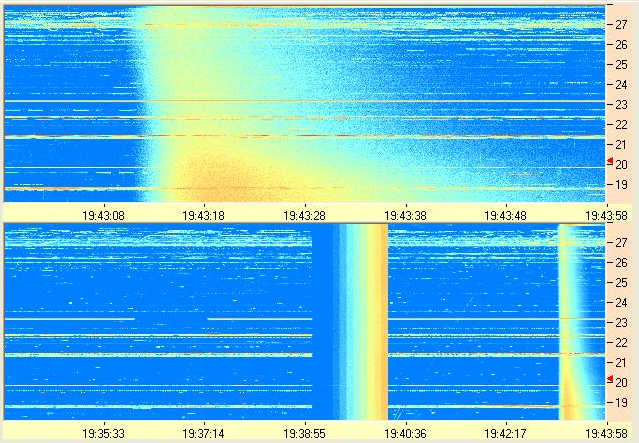 Following the radio noise burst (which was accompanied by an X-ray flare) the spectrum appears devoid of most all stations. The X-ray flare has caused a dramatic increase in ionospheric absorption – which accounts for the fact that signals from most distant stations disappear in a radio blackout. The few remaining stations were probably local to the observing station in Hawaii, and hence their signals were not affected by the condition of the ionosphere. the spectrograph is connected to an automatic calibrator that steps through several different noise temperatures. The temperature is raised from low (blue) to high (red), in 3 dB steps. this signal is from an instrument used to measure properties of the earth’s ionosphere. When a sweeper passes through the frequency of a Jove receiver it sounds like a short chirp. depending upon the state of the ionosphere and propagation conditions there may be several different sweepers visible. Vertical lines are likely due to distant lightning. This is an early evening record from Florida. Stations and lightning are more evident at the lower frequencies. Later at night the ionosphere will become more transparent and fewer stations, lightning, and sweepers will be seen. The diagonal bands are courtesy of the local Hawaiian electric company. The slope of the lines results from arcing which occurs 120 times per second beating with the sweep frequency of the receiver (10 sweeps per second). The Radio Jove project is reaching an important milestone - its 10th birthday! A future issue of the Jove Bulletin will provide more details on this important event along with some important changes. Jim Sky's article on Radio -SkyPipe 2 is one significant milestone with more to come.